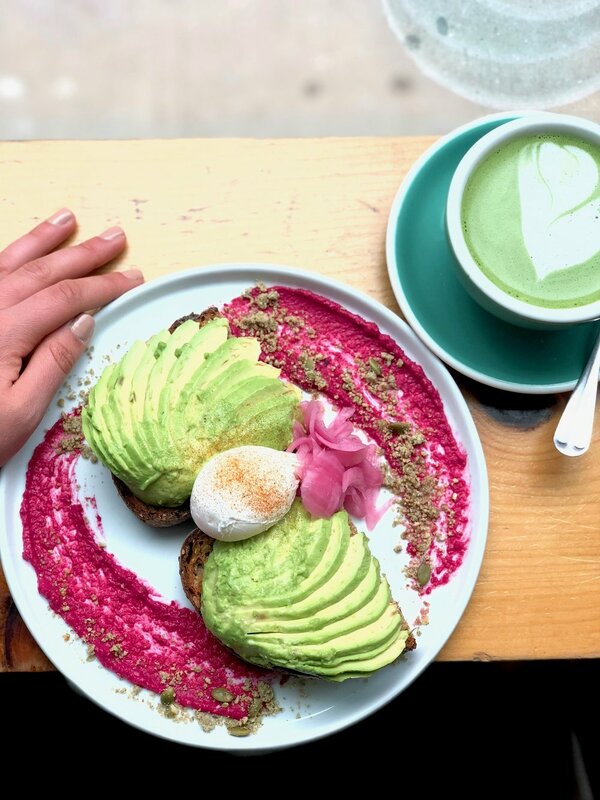 A Guide to New York City's Matcha Cafes — Copina Co. Switching from coffee to matcha has been a MAJOR game-changer for my skin, energy and overall health vitality. It’s been a crucial component of my morning routine. No matter where in the country I am, I love starting my day with a soothing, warm cup of matcha. What someone’s relationship is to coffee is 100% my relationship to matcha. Between all my meetings, travel and work, maintaining this simple morning routine keeps me balanced and grounded. It’s important to know that you can adapt your routines to the environment around you. I definitely don’t bring my own ceramics when I’m traveling (I wish!) but instead adapt to what’s around me - even if that means drinking matcha out of a travel mug on a plane. It’s easy to find your flow once you know what your body needs to stay healthy and vibrant. A few weeks ago I was in New York City and because I knew how much I love (admittedly, NEED matcha) I found it everywhere! Here’s my New York City guide for the matcha obsessed. Location: Soho on Spring St. If I imagined a matcha shop of my dreams Matchaful would be it. They offer a mix of authentic traditions with new trends and while they’re a bit more expensive than most, the quality is a 10/10. What particularly stood out was their large selection of matcha, their dedication to craft, and the fact that their lattes are entirely customizable. This was the ONLY place in the city where I could customize my latte to get MCT oil and collagen in my matcha, and also choose from other superfood options. The presentation was absolutely stunning. They whisk the matcha in beautiful Japanese ceramics made by a local artist in Brooklyn and if you order in, they serve it to you in these fabulous kintsugi ceramics. My latte came with rose petals and “ZEN” stenciled on top, making it extra Instagram-worthy and provided all the vibes as I sipped and tucked into some work on my laptop. 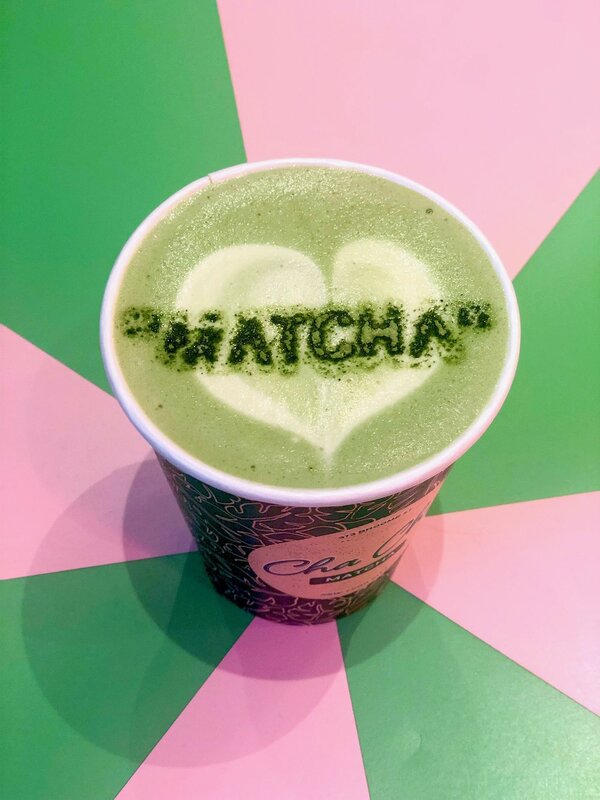 Cha Cha Matcha instantly perked me up with their bright pink and green cafe colors on the early mornings before a workout and in desperate need of my caffeine fix. I came to love this place for its efficiency whenever I was in a rush. They kept the line moving and I never waited more than 5 minutes after ordering. What was so fun was watching them use a mechanized matcha whisk with giant pink and green ceramics that whip up the matcha tea to perfection minutes after ordering. Such a treat! The only downside was there was very little customization. I wanted to add in some of the superfoods found in their “seasonal lattes,” but was told that they blend all the specialty latte mixes in advance. Probably best to stick with an OG matcha latte here. The presentation was cute and each matcha had a fun stenciled design made from matcha and beet powder. On one occasion, I got one that read “matcha,” and it’s definitely possible they knew how much I needed it. I don’t know about you but I always have trouble finding a satisfying meal at a matcha cafe that isn’t pastries. They had it! After running around the city all day I would find myself eating lunch around 3pm. It was amazing to find out that Citizens of Chelsea serves breakfast all day and stays open until 6pm. Total life-saver! The lattes are made exceptionally well and look beautiful. They were served in fun, vibrant ceramics and those cute foam shapes that make you want to photograph everything. The spot is cozy with outlets, wifi and window seating options so you can get some work done while enjoying something delicious. Matcha tea has been around for thousands of years and traditional Japanese matcha practices are at a level all their own. It’s easy to forget this with how “new” and “trendy” matcha seems. I think it’s important to expose yourself to the traditions around this drink as well as the fun new recipes. This tiny matcha shop gives you a taste of the expansive properties of matcha from the way it’s ground up to the regions from which it’s sourced. This experience taught me that matcha, much like fine wine, has regional varieties in Japan. Some are bitter, some are sweet, and some are in-between! The owner taught me that great matcha is stone-ground (Setsugekka, in fact, grinds all their matcha in-house). I also learned that you should always purify the whisk and bowl with hot water before grinding and the ideal temperature for drinking matcha is 175℉ as water that is too hot will damage your matcha. This is THE PLACE to buy your matcha tea powder in the city and if I lived in NY, I would always buy my matcha here. The colors are incredible, you can choose your matcha by region (price varies), the taste is extremely potent and the price is reasonable for the quality. I was able to buy a 100g tin of matcha from a specific region in Japan for just about the same price that I'd seen 40g tins sold for at some other matcha cafes in New York. I bought a ton of matcha for myself there as well as gifts for Alex and my family. All in all, this cafe was a beautiful experience of incredibly quality for a price that gives you what you pay for. While the others were great for on-the-go, this cafe had an experience like no other. Highly, highly recommend! Good food, good vibes. Do you need anything more? This Australian cafe felt very cozy and the baristas were Australian making it a very authentic experience. I order yummy green baked eggs with veggie, avocado and pesto - so good! The lattes were delicious. I only wished they served them in tinier glass cups instead of the mugs it came in. They lost their heat quickly, were small in portion size, and weren't very pretty. Such a fun and relaxed spot, They tend to get busy, but I promise you, it’s worth the wait. This is a great place for a casual breakfast with some friends on the weekends. They have insanely amazing toasts, bowls, and sandwiches so you'll always be able to find something to please anyone. Their menu is expansive and has a little something for whatever you're in the mood for. Their matcha latte was a traditional cafe matcha latte, not as good as some that I had in the city but still enjoyable and I would definitely go back with a friend! Looking for a delicious matcha recipe? Try these out!